My Sassy Girl (Hangul: 엽기적인 그녀; RR: Yeopgijeogin Geunyeo) is a 2017 South Korean television drama starring Joo Won, Oh Yeon-seo, Lee Jung-shin and Kim Yoon-hye, based on the 2001 South Korean movie My Sassy Girl by Kwak Jae-yong, but during Joseon period. It aired on SBS every Monday and Tuesday at 22:00 (KST), starting May 29, 2017. 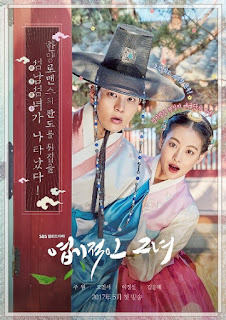 Plot: Love story of a cold city scholar Gyeon Woo (Joo Won) who's known as "Joseon's national treasure" and the sassy princess Hye-myung (Oh Yeon-seo) in a Joseon Dynasty era.